hardwork,in this article we will take a good look at the top 10 richest billionaire men and women in Africa this year. 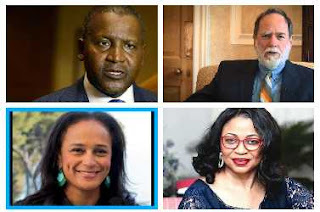 Out of this billionaire list of about 23 richest Africans,only two are women this is according to the American business magazine called Forbes. South Africa has the highest number of Forbes recognized billionaires in Africa. Aliko Dangote is still the richest man in Africa for the seventh year in a row,with a net worth of $12.2 billion US dollars, Dangote has a diversified interest in business such as in real estate,sugar,flour,cement Etc. He is also the richest black man in the world. Diamond mining heir Nicky Oppenheimer ofAfrica,is the 2nd richest person in in Africa with a current net worth of $7.7 billion. He was the former Chairman of De Beers diamond mining company and of its subsidiary the Diamond Trading Company, and former Deputy Chairman of the Anglo American Corporation. Nassef Onsi Sawiris is an Egyptian billionaire businessman,and also the youngest of Onsi Sawiris' three sons. Back in 2017,he was estimated to be worth about $5.3 billion,but an increase in the share of his holding which includes: shoemaker Adidas,LaFarge Holcim,and OCI pushed him up to $6.8 billion. He is currently the richest man in Egypt. Mike is a seasoned Nigerian businessman, and also the 2nd richest Nigerian. His company Glo is one of Nigeria's biggest telecom operator,the billionaire also owns stakes in Equitorial Trust Bank and Conoil. Glo network also has presence in some West Africa countries. Holding down the 5th spot is Angolan businesswoman named Isabel dos Santos,she is the eldest child of Angola's former President. Isabel is a business woman,she dropped down from $3.2 billion a year ago due to a lower value for an Angolan bank Banco BIC,regardless she is still the richest woman in Africa. Patrice Tlhopane Motsepe is a mining businessman and founder of African Rainbow Minerals,his company has interest in gold, ferrous metals, base metals, and platinum. He is also the non executive chairman of Harmony Gold,which is rated as the world's 12th largest gold mining company,in 2012,he was the richest man in South Africa. Folorunso Alakija was once the richest black woman in the world and in Africa when she unseated Oprah Winfrey in 2014. The business woman has interest in fashion,oil and printing industries. She is also the owner of a Nigerian exploration firm called Famfa Oil,she partnered with Chevron and Petrobras on a lucrative offshore oil deal,currently she is worth $1.6 Billion dollars. Desmond Sacco is yet another mining billionaire from South Africa. He is the Chairman and Managing Director of Assore Limited. Currently he has a net worth of $1.3 Billion. Michiel Le Rou is one of Africa’s millionaire that has newly joined the billionaire club. He is the founder of South Africa's Capitec Bank Holdings,whose stock climbed last year making him a new billionaire. He owns about 11% stake in company which targets South Africa's emerging middle class. Stephen Bradley Saad is a South African billionaire,who is the founder of one of the top medicine producer in Africa. He has a Net worth of $1.09 billion dollars.